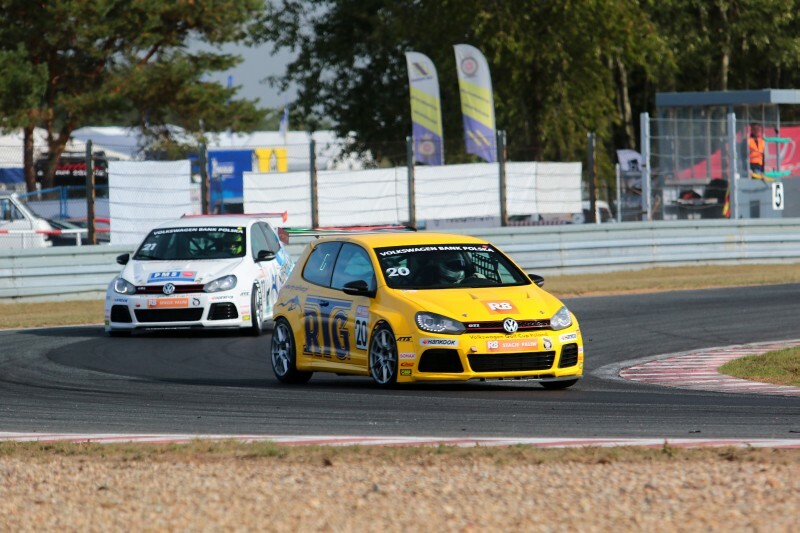 The qualifying session before the last round of the Volkswagen Golf Cup were held afternoon, which meant conditions were the best on the very beginning of the session. Everything was caused by the temperatures falling down, as well as the grip. The key was to find the perfect match in the very first minutes of the time trial and drive an optimal lap without looking for one’s pace. Dylan Pereira was the best in those conditions – he was also the pace setter in the earlier practice sessions. The driver from Luxembourg did a one lap with time 1:43,730, being faster than Jeffrey Kruger, who lost 0,196 second. The leader of the overall standings was also the only driver to fight with Pereira, as the foreign duo went far away from the whole grid. The last driver to finish in top 3 was Piotr Parys, being also the best Pole on the starting positions. The driver from Lublin also managed to beat his closest rival – Simo Muhonen. The fifth place went to Marcus Fluch and behind his back the only female driver in Volkswagen Golf Cup – Gosia Rdest. The top 10 was closed by Andre Gies, Sebastian Arriola, Marcin Jaros and Michał Gadomski, who used the spare car after the crash in the practice session. After checking the second best lap times it turned out that the pole position to the afternoon Sunday race also went to Dylan Pereira’s hands. Behind his back we will see Kruger, Parys and Muhonen. However, Gosia Rdest managed to overtake Marcus Fluch and will start from the fifth place on the grid. Marcin Jaros managed to advance to 7th, while to last top 10 finishers were Sebastian Arriola, Andre Gies and Michał Gadomski. Tomorrow drivers will have to face two races, which will decide about the final positions in the overall standings. The first of them is scheduled at 9:45 a.m., while the second one will start precisely at 2:00 p.m.! Dylan Pereira: - I am extremely happy as I managed to get on the pole position twice. I hope tomorrow I will be able to keep those places until the last metres of the rivalry. The battle in the championship won’t be easy, though I am still in the game and you can’t predict what happens tomorrow. Let’s hope things will end up my way. Jeffrey Kruger: – The qualifying went quite well for me, as to both races I will start from the 2nd place. In front of me there is my main rival in the overall standings – Dylan Pereira, so tomorrow we will have an interesting fight. I have a big advantage in points, so it will be crucial tomorrow to drive carefully, as the title is very close. Michał Gadomski: – This weekend is unfortunately not going my way. Due to the crash in the practice session I had to start with a spare car in the qualifying – though it didn’t change my fortune. I don’t know why, but I had a flat tire on my front left wheel, which is the most important here. It caused I was able to finish only on the 10th place. Tomorrow I will try to minimalize my lost positions.